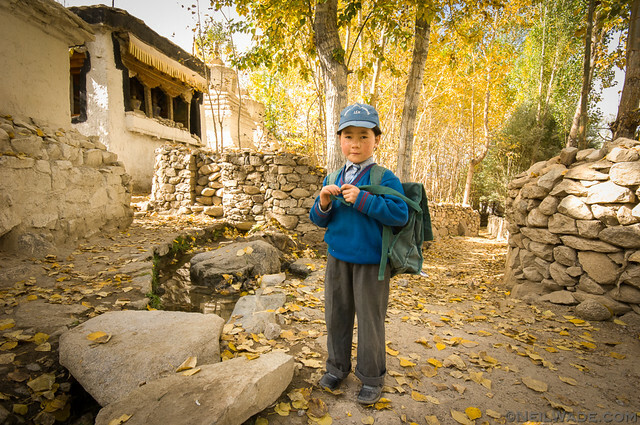 My story of Leh actually started a few hundred kilometers to the south in one of the northernmost, ethnically Indian town called Manali. 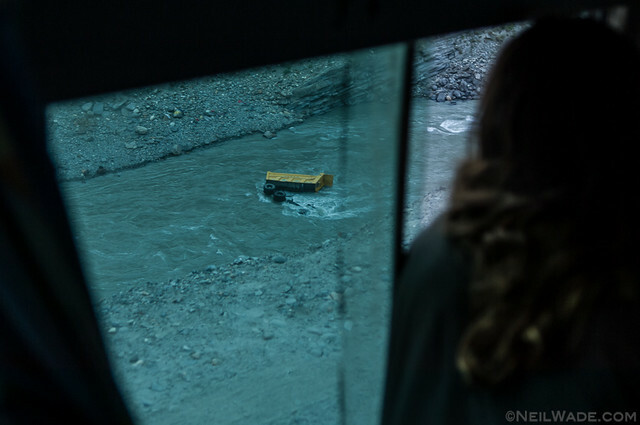 I was lucky enough to hitch a ride on the very last bus to headed north for the whole season. Soon the snows would fall in the high passes all around Leh, making road travel impossible. 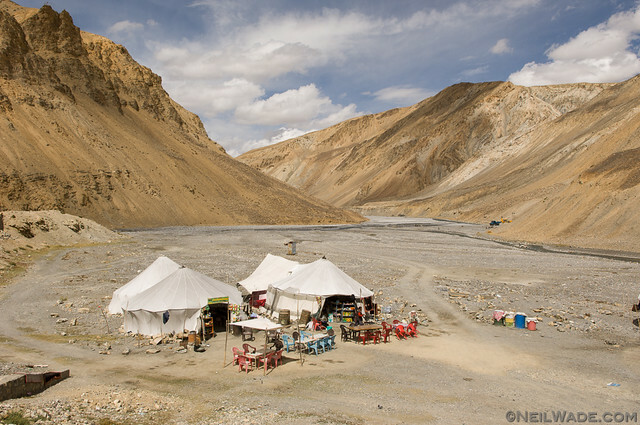 The drive from Manali to Leh normally takes two days for the bus, which is considered quite quick by local standards. As we soon found, it includes time for broken suspension, flat tires, and god knows what other mechanical problems. It took us three full days, and two different buses. A reminder of just how dangerous these roads are. 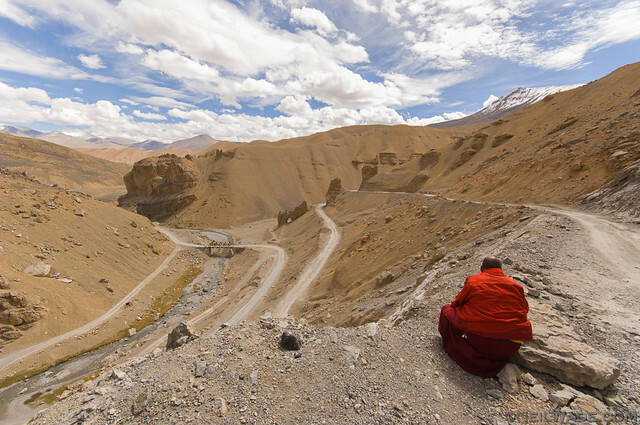 It’s probably not too hard for you to figure out what this monk is doing in this remote, treeless landscape. 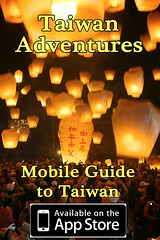 Every few hundred kilometers, there was a “rest stop” with tents to rest in, and a few basic refreshments. 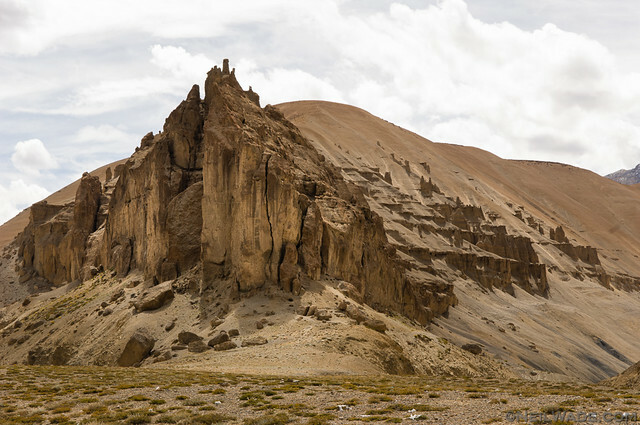 Arriving in Leh… um… some time later… I remember feeling as if I was entering a fairy tale valley. 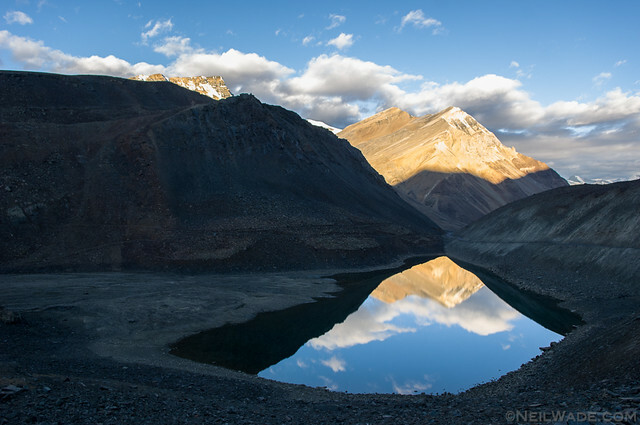 The drive from Manali goes through beautiful mountains, but all the landscape is very dry, without vegetation. The valleys around Leh are green and fertile. And at this time of year (mid Sept), everything was being harvested. It really felt like the Autumn back in Pennsylvania… Truly heaven. And yet it was a busy city, with loud trucks and busy markets. I remember the old town being quite nice, like most old towns are. 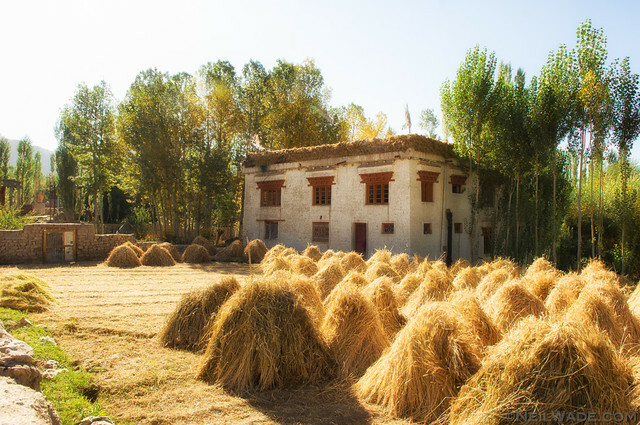 There’s an old Tibetan palace and a few temples overlooking the city. 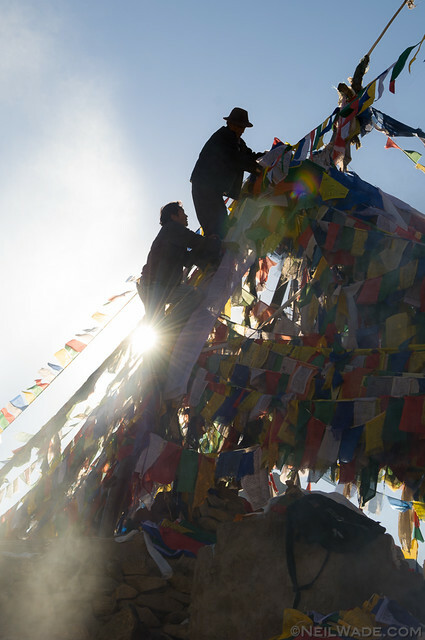 Also, despite being mostly Tibetan, there was a good representation of Muslims, with their beautiful mosques and serene calls to prayer. 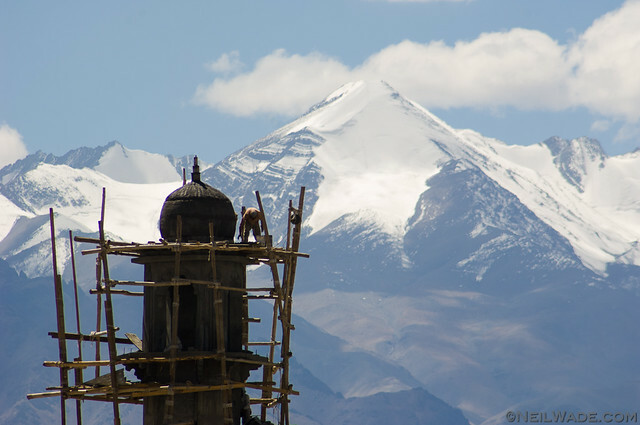 A worker works on a new minaret for one of the mosques in Leh, India as the formidable peak of Stok Kangri looms. 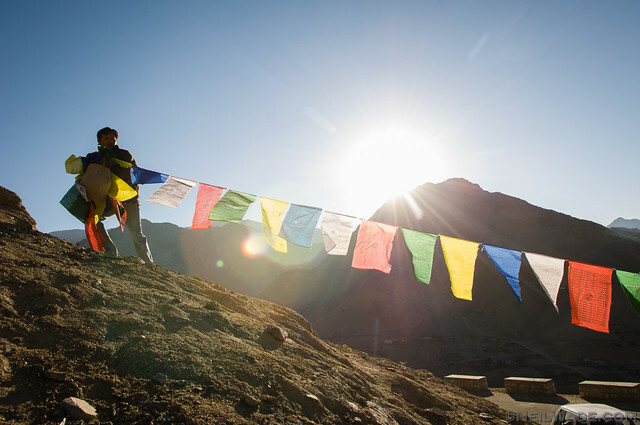 Two Tibetan men hang prayer flags near the Namgyal Tsemo Gompa in Leh, India. 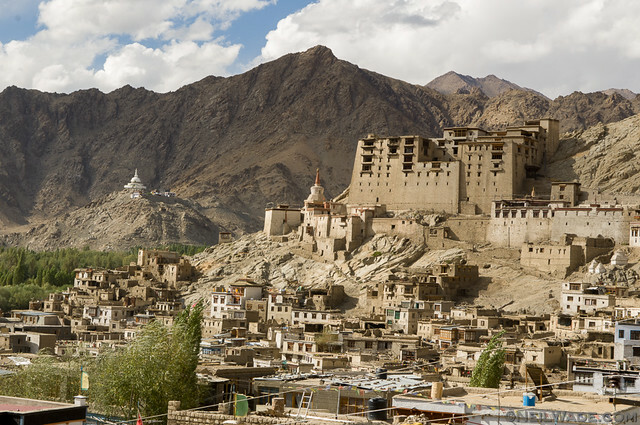 The Namgyal Tsemo Gompa (The formal royal palace) looms over Leh, India. 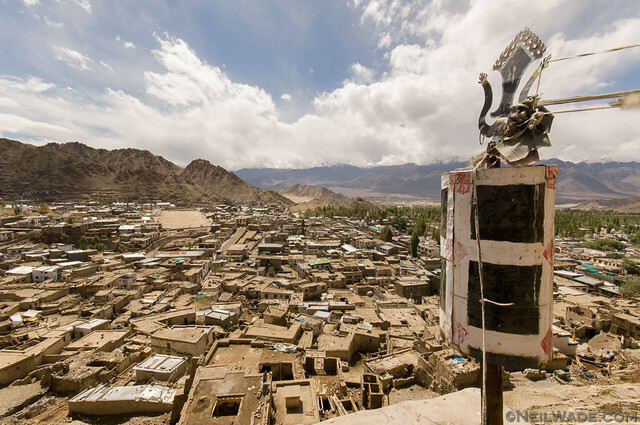 A look over Old Town Leh, from Namgyal Tsemo Gompa. 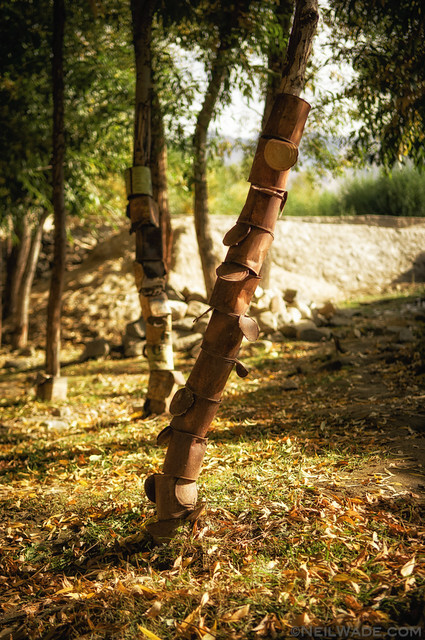 I was in Leh at the end of the summer and tourist season. The climate, harvest, and atmosphere really reminded me of Pennsylvania in the fall. I guess there are jokers everywhere. I was hoping someone would walk through this nice area for me to photograph when this young man strolled up. 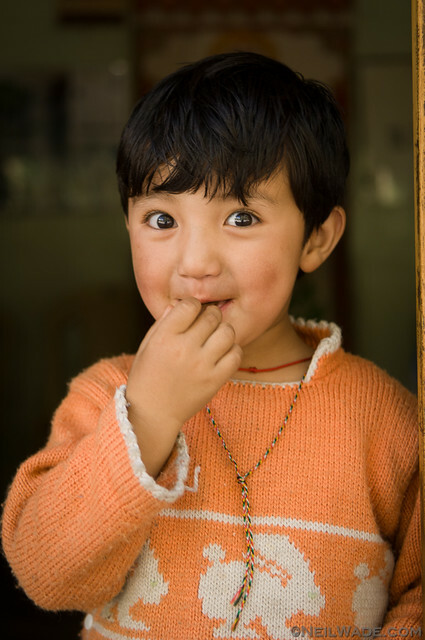 I think this little guy was pretty happy to have some chocolate. 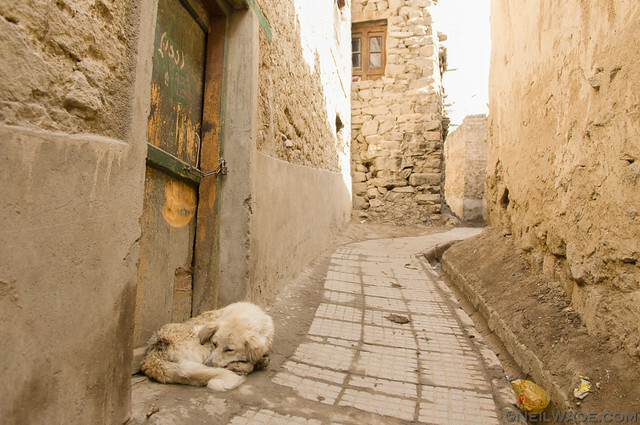 A dog sleeps in a doorway in the old town of Leh, India. Besides the memories of those beautiful fields and trees, the memory that sticks most in my mind was renting a small motorcycle and going for a ride. 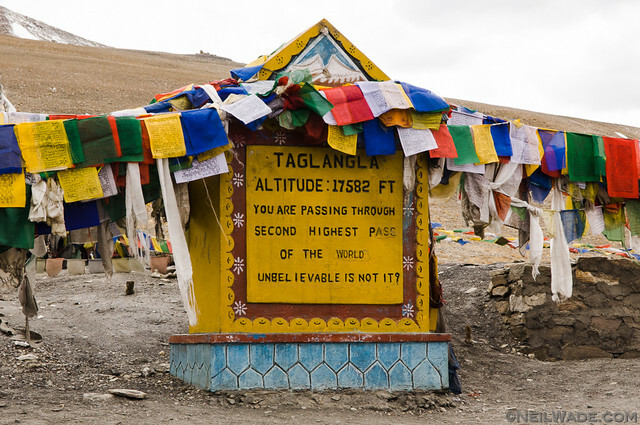 Just north of Leh, is Khardung La, the highest motorable road in the world at 18,380 ft, 5,602 m, or 3.5 miles! I was completely unprepared: No helmet… No winter clothes… I had to wear every article of clothing in my travel bag and put socks on my hands as gloves… The bike barely made it… It was SNOWING when I got to the top… IT WAS AWESOME! 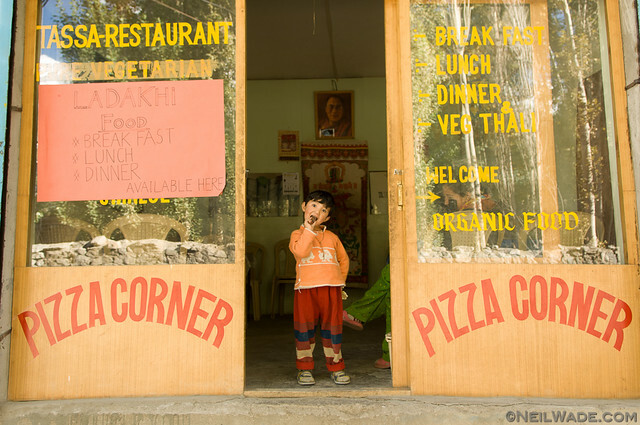 I might even be doing it again this summer, but driving the motorcycle all the way from Manali. 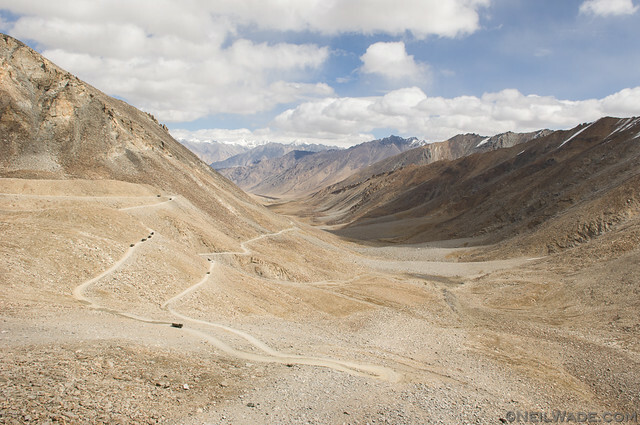 The highway to the highest pass in the world is very desolate just on the Nubra Valley side. 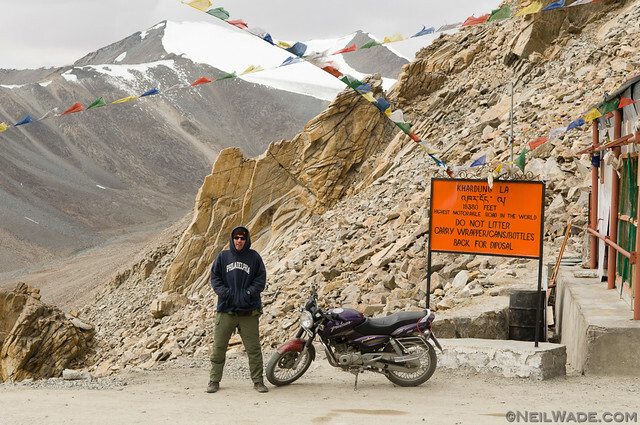 Despite being mid-September, I had to wear every article of clothing in my bag to make over Khardung La, the highest motorable road in the world (18,380ft, 5,602m, 3.5miles!). I even had socks on my hands to try to keep warm! 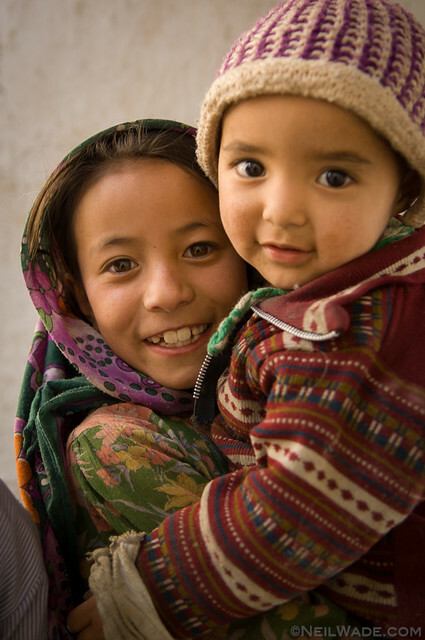 Really awesome photographs. 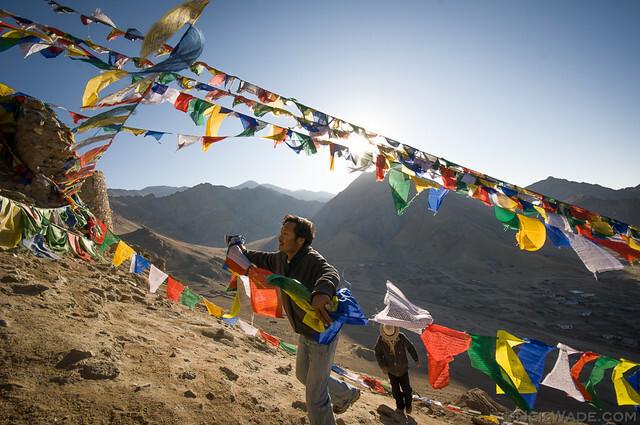 This pages really leaves an impression to visit Leh, to anyone who come by this site. Thank you for this post.